From filling sold-‐out clubs across the nation, to appearing weekly as a regular on Chelsea Lately, Jo Koy has come a long way from his modest beginnings at a Las Vegas coffee house. His infectious, explosive energy onstage, insightful jokes, and family-‐inspired humor crosses all boundaries. 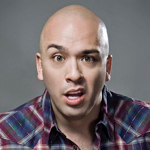 In 2007, Variety magazine named Jo Koy one of the "10 Comics to Watch!" Raised in Tacoma, Washington, Jo credits his mother for his comedic and acting talents. Encouraged by his mom, Jo participated in school talent shows and presented impromptu performances for his family and friends. This loving support led to the Las Vegas coffee house, and inspired a move to Los Angeles. In 2005, Jo hit the "opportunity of a lifetime" with a performance on The Tonight Show with Jay Leno. He became one of a select few ever to receive a standing ovation. Since then, he has appeared several times throughout the years. A single father, Jo Koy was inspired by his son and began working on his first Comedy Central special "Don't Make Him Angry," which aired in January 2009. His much-‐ anticipated second Comedy Central special "Lights Out" aired in October 2012, and is now available on DVD.